DATA PLATE 24 VOLT GENERATOR 25 AMP. HIGH QUALITY US MANUFACTURE. 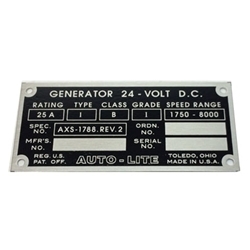 Autolite Data Plate Generator 24 volt. These are high quality AJP production plates US made. These plates are often damaged or missing. Nice detail for you high level restoration. Plate includes special drive rivets too. Please note they are not stamped but we do offer stamping services on all of our plates. Call or email for details.